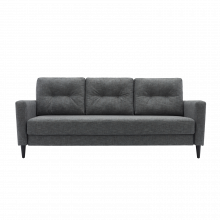 G Plan Fifty Four Sofa Bed. Like a real 50s sofa bed, except it's comfy and easy to use! It's substantial and well-made, with stylish retro proportions that capture an era when the UK was becoming the home of cool. The Fifty Four sofa bed is the perfect choice for flexible living. Inspired by G Plan's revolutionary archive designs, this is a stylish sofa with hidden depths. Neatly tailored arms with deep buttoned cushions offer comfy seating by day and effortlessly transform to a generous king-sized sleeping space by night.